*Please note this is a download and not a DVD. Bible stories come alive with Ron Wheeler's unique black and white animated line art style. Narrated with sound effects and music, children and adults will be captivated by God's Word. Ideal as supporting media for Sunday school or sermon messages, it also serves as a great tool for homeschoolers or family devotion time. Each MP4 video download includes coloring pages and discussion questions. Luke 5: Jesus Calls the First Disciples! 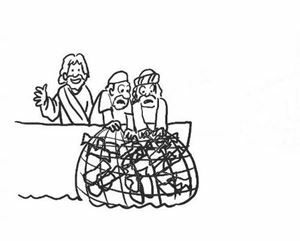 1:54 minutes After a long night of casting out nets and not catching one fine-finned fish, the fishermen were told by Jesus to try once more. They agreed, and what did they find? Could it be true? Two nets so full of fish the boats started sinking! 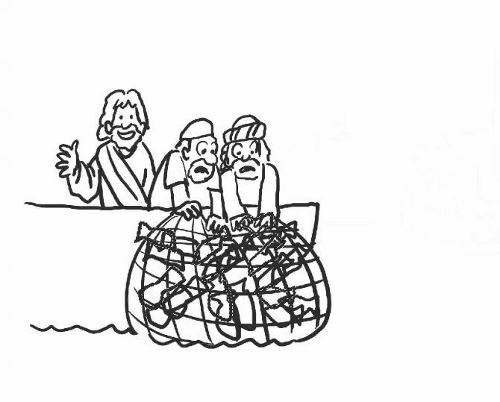 Find out what Jesus called the fishermen to do in this animated Bible story produced in the Biblemations series. You can check out a sample below: Biblemations - Luke 5 Jesus Calls the First Disciples from keyforkidsministries on GodTube.